Mix all other ingredients in a large mixing bowl. Grab a deep baking sheet. Spoon 1 inch balls of mixture, and place them on the baking sheet. Don’t roll them into balls yet, you’ll do it later. 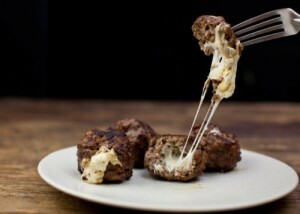 Once you’ve spooned the rest of the meat mixture, grab a piece of cheese and basically mold the sausage mix around it. Place back on the baking sheet. Bake for 15-20 minutes and rotate the meatball with a pair of tongs. Bake for an additional 15-20 minutes or until the meatball is cooked through and crispy on the outside. Remove and serve with a toothpick and dipping sauce of your choice. I used marinara.